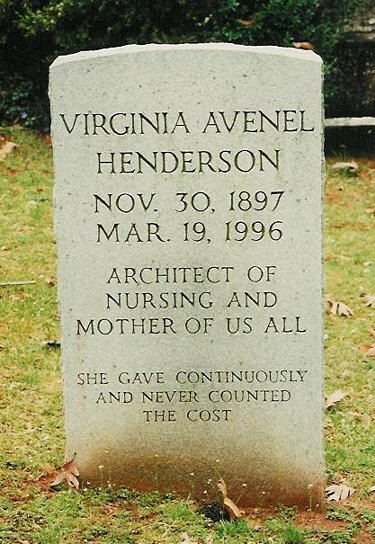 Virginia Henderson was born in Kansas City, Missouri, the daughter of Daniel Brosius Henderson and Lucy Minor Abbot. Named for the State her mother longed for, she returned there at age four and began her schooling at Bellevue, a preparatory school owned by "Grandfather", William Richardson Abbot. Her father was a former teacher at Bellevue and an Attorney who represented Native American Indians in disputes with the U.S. Government, winning a major case for the Klamath tribe in 1937. Her schooling was thorough but did not yield a diploma, a fact that delayed her entry into nursing school. Patriotic fervor stimulated her enlistment in the Army School of Nursing in Washington, D. C. where the students were treated like cadets in the U. S. Military Academy. Courses were taken at Teacher's College, Columbia University under the direction of her mentor, Miss Annie Goodrich. She graduated in 1921 and practiced nursing at the Henry Street Settlement in New York City. She began her career as a nurse educator in 1924 at the Norfolk Protestant Hospital in Virginia where she was the first and only teacher in the school of nursing. After five years there she returned to New York to begin formal degree studies in nursing at Teacher's College. These were interrupted for a year when she practiced nursing at the outpatient clinics at Strong Memorial Hospital in Rochester, N.Y., returning to complete her Bachelor's and Master's degrees with the aid of a Rockefeller Scholarship. For the next sixteen years, she taught nursing at Teacher's College and practiced nursing at major New York teaching hospitals. Macmillan Publishing Company asked her to write a new (1939) fourth edition of the Harmer textbook which became a standard reference. "nurses assisted individuals, sick or well, in the performance of those activities contributing to health, its recovery (or to a peaceful death), that they would perform unaided if they had the requisite strength, will or knowledge." This description of nursing concluded with the objective for giving nursing care; to help the individual be free of help as rapidly as possible. The textbook was used uniformly throughout hospital nursing schools in North America and served to standardize nursing practice. The International Council of Nurses commissioned her to write an essay entitled Basic Principles of Nursing Care (Geneva, 1960) for the use of nurses who had neither access to technology nor the medical care required to establish disease diagnoses. The ICN publication is available in 29 languages and is in current use throughout the world. Henderson's career in research began when she joined the Yale School of Nursing as Research Associate in 1953 to work on a critical review of nursing research. Her findings indicated that most nursing research studied nurses, not nursing care. A series of editorials she wrote for professional journals helped stimulate the reorientation of nursing research which became much more clinical. Noting the absence of an organized literature upon which to base clinical studies, she embarked on a project to annotate nursing literature. The four volume Nursing Studies Index was completed in 1972 and was hailed as her most important contribution to nursing science. Miss Henderson started her most important writing project at the age of 75 when she began the sixth edition of the Principles and Practice of Nursing text. Over the next five years, she led Gladys Nite and seventeen contributors to synthesize the professional literature she had just completed indexing. With the wisdom gleaned from over fifty years in the nursing profession and the opportunity to review the writings of all principle authors who wrote in English, she fashioned a work that both thoroughly criticized health care and offered nurses an opportunity to correct the shortcomings. The book operates on two levels; individual and global. She argued that health care will be reformed by the individual nurses who will enable their patients to be independent in health care matters when patients are both educated and encouraged to care for themselves. She took this philosophy to new heights by eliminating medical jargon from the text and declaring it is a reference for those who want to guard their own or their family's health or take care of a sick relative or friend. A warm and vivacious person, she traveled the world at the invitation of professional societies, universities and governments. She was a prolific writer who hated to write. She lived long enough to complete a set of widely translated and influential works, the likes of which were last written by Florence Nightingale. She spoke of the necessity of a universal, comprehensive health service for all, the absurdity of for profit health care and for patients to keep and contribute to their own health records. She died at the Connecticut Hospice featured in her writings and experienced the peaceful death she desired for all mankind. She is buried in the family plot of the churchyard of St. Stephen's Church, Forest, Bedford County, Virginia. Halloran, Edward (1995) A Virginia Henderson reader; excellence in nursing. Springer Publishing Co.: New York,. Henderson, Virginia; Nite, Gladys. (1978) Principles and practice of nursing sixth edition Macmillan: New York and London. Reprinted by the International Council of Nurses in 1997, now available from the bookstore of the American Nurses Association.